Hanging the strop: The strop is needed to maintain the blade edge for shaving. When using a hanging strop it is attached to a wall, counter or other fixture such as a towel rack so that the strop is about chest height and in a location where you can pull the end out with your non-razor hand as you strop the razor on its surface. If you have a linen or canvas backed strop, there are several schools of thought about which side of the strop to use first. The general view we provide is from DOVO in Solingen, Germany with regard to the use of their products. Once you become more experienced and educated you can try different techniques to see what works best for you and your razor. In general, many men believe in the use of the linen side of the strop to “warm up” the blade before using on the leather side of the strop. On the other hand many men simply strop on the leather side and that’s it. The leather side is always used and the other side is optional. So to make a long story short: if the individual favors using the canvas back, they should "strop" the razor on the canvas side first (which should be prepared with the grey paste), then on the leather side (which should be prepared with the yellow/white paste). Simply put on a small amount of paste in several locations along the strop and distribute evenly over the surface by rubbing it in with the heel of your palm or the smooth side of a glass bottle or jar, for example. The leather will become more pliable over time. Only reapply the paste occasionally, if needed. The strop should be used prior to shaving, and never- under any circumstance- after shaving. This is because after shaving the delicate cutting edge is kind of bent (not visible to the naked eye), and you would break tiny metal pieces out of the cutting edge. This would consequently lead to cuts in the skin. Many refer to this condition as a burr from misaligned micro-separations that occur when the razor is used, but will go back into position and become fine again after approx. 24 to 30 hours. Stropping just before use will further align the blade edge and put it in shave ready condition. In order to get the best daily shave with a straight razor DOVO even suggests an individual even consider having at least two straight razors on hand to fully allow time for the blade edge to rest between shaves for optimal performance. Place the blade flat on the strop. Basically, the blade lays flat as you strop, with the back of the blade’s shoulder (the side edge of the back portion of the blade) barley touching. You don’t want to hold the blade’s back to high away from the surface of the strop as it will not maintain the appropriate edge angel when stropping. When using a hanging strop, keep it under constant tension to create a sharp cutting edge. If you let the strop hang too loosely, the edge can become rounded and therefore blunt. Start by running the blade away from your body with the edge facing you and leading in the direction of the razor’s back, thereby stroking away from the cutting edge. If you strop the other way, in the direction of the edge (which is the case during honing), you will cut through the strop or cause nicks which can damage the blade. Go slightly diagonal to strop the entire blade surface depending on the width of the strop. Be sure to use an evenly constant touch when stropping and make sure that the complete cutting edge is touching the strop for the wide width model.For a narrow strop, keep the blade at an even 90 degree angle to the strop's side while moving the blade in an "X" (diagonal) pattern up and down the strop. For example, "/" as you strop away from you, and then "\" as you strop towards you making for a complete "X" pattern at the end of the complete rotation. While you won't be stropping the entire blade at the same time, the entire blade edge will make contact with the strop by using the diagonal "X" pattern. 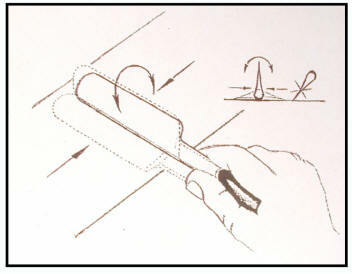 When turning the blade to strop the other side and come back in the other direction (and to prevent blunting the cutting edge) keep the blade’s back in contact with the strop as you swing the blade180 degrees as shown in the sketch above. Repeat this back and forth stropping motion. If you use the canvas side too, use this procedure first on the canvas (about 10 stokes) and then on the leather about 10 to 20 strokes. This should be sufficient to bring the razor to a smooth, shave ready edge. In conclusion: A strop is for daily maintenance of the razor’s edge. A hone is designed to grind the edge of the razor and should not be necessary very often - perhaps once or twice a year when using proper stropping techniques. Some men will use a stropping paste available in several grits when a mild, or occasional, sharpening action is needed. When using a sharpening paste be sure you use a separate strop for each type of paste, and never mix them on the same strop. Using a sharpening paste may also lengthen or alleviate the need for a hone except on rare occasions. As always, experiment to see what works best for you.